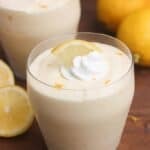 This easy homemade Lemon Cream Mousse is delicious as a stand alone dessert or can be served with my homemade berry cake! I’m a lover of puddings and mousses, but they MUST be homemade. There is no comparison in the taste of a box pudding mix, versus the real deal. I feel like they’re sometimes a forgotten dessert, because a box mix has taken the novelty (and flavor) away. After a nice dinner, especially if you have guests over, I love the simplicity of a homemade pudding or mousse, served with some berries on top. Homemade Tapioca Pudding is probably my favorite, followed by this Baked Custard Style Rice Pudding and Vanilla Pudding. But a good chocolate mousse or lemon mousse is always a winner too. I love that you can make them a day or more in advance, saving on prep time. Sometimes that best desserts are the simplest. If you really want to take this Lemon Cream Mousse to a whole new level of easy and impressive, serve it with this berry cake. 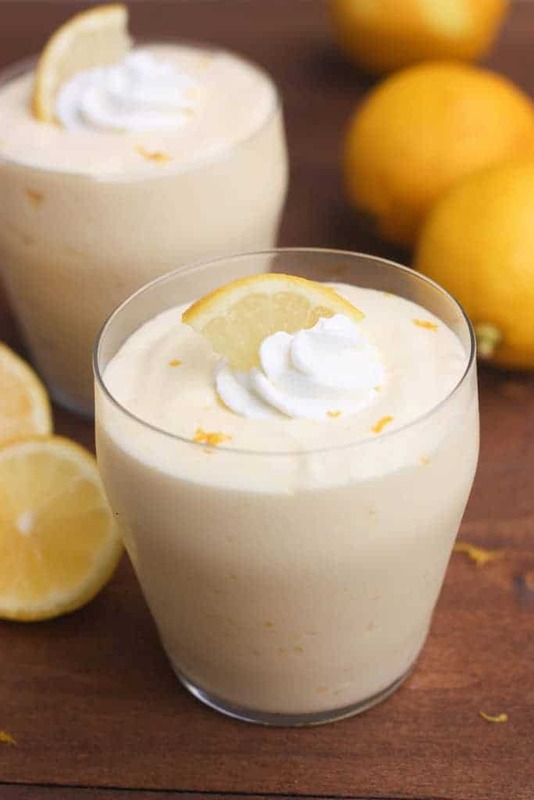 Easy and delicious homemade Lemon Cream Mousse. Fill a large saucepan with a few inches of water and bring to a simmer over medium heat. In a large heat-proof bowl, whisk together the 3 whole eggs, 3 egg yolks, 1 cup sugar, the lemon zest, lemon juice, and a pinch of salt. Place the bowl over the pan of simmering water and cook, stirring constantly with a wooden spoon, for about 10-15 minutes. (Once the mixture starts to thicken a tiny bit you may want to switch to a whisk to stir it). Remove from heat and set aside for 15 minutes. Place a piece of plastic wrap directly on the surface of the mixture and refrigerate for at least 1 hour or until completely chilled. Place the 3 remaining egg whites in a mixing bowl and beat on high speed for 1 minute. Add remaining 2 tablespoons of sugar and continue to beat until the whites are stiff. Carefully fold the beaten whites into the cold lemon mixture. Place the cream in the same bowl the whites were in and beat on high speed until stiff peaks. Carefully fold the whipped cream into the lemon mixture. Chill and serve cold with sweetened whipped cream. Do you know how long the mousse can chill for? It should last a few days in the fridge. I loved the idea of serving petite lemon mousse in cups with a blueberry on top. This was a perfectly lemony, creamy dessert. Perfect for what I needed! Hello Lauren. Can this dessert be frozen? Hi Cynthia, although I haven’t tested it to say for sure, I wouldn’t suggest freezing this mousse. I fear it would break down as it thaws and the texture wouldn’t be the same.